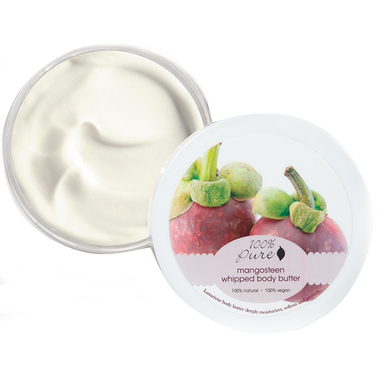 100% Pure's Body Butter is a super thick, rich and luxurious. Creamy butters melt onto your skin to soften and deeply moisturize. Concentrated with vitamins, antioxidants and anti-aging nutrients to keep skin healthy, nourished and youthful. Free of sulfates or other detergents, chemical preservatives, artificial fragrances, dyes or any other toxins. Truly 100% pure. This product is very rich and buttery. Definitely helps to moisturize dry skin. Fair price: great ingredients. The scent, which is kinda like sour tropical fruit (not pleasing to me), is quite strong. Overall, I would consider repurchasing in a different scent.